If you’re planning a winter wonderland wedding then look no further than the beautiful Snowflake Burst wedding suite from Bee Happy Designs! We’re thinking of a roaring log fire, twinkling lights and cosy soft throws for your guests to snuggle under as they admire you dressed in your beautiful white dress, embellished with a gorgeous fur bolero and sparkling diamonds. 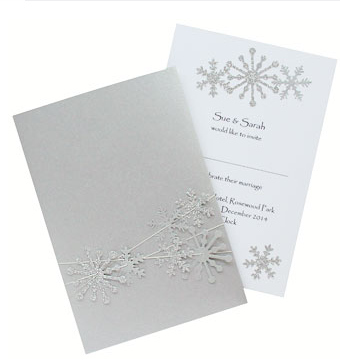 Winter weddings are among our favourites, thanks to the sheer scope for making every part of your wedding picture-perfect, which is where the Snowflake Burst wedding invitation comes in! Hand finished with a criss-cross selection of threads and glittery snowflakes, this invitation certainly exudes luxury and style as well as providing the perfect introduction to your big day! The brilliant wallet design means that everything arrives in a perfectly pristine bundle for your guests to dive into with great delight, whilst each sparkly snowflake is sure to catch their eye and get them in a celebratory mood! Professionally printed onto a choice of pearlescent, textured or smooth card, this wonderful wedding suite includes Save the Dates, RSVP/Information Cards, Order of Service, evening information, place cards, menus, table markers, table plans and Thank You cards, giving you the option to use this magical design throughout your wedding celebrations! Whether the silver and white colour scheme is exactly what you’ve been looking for, or you’ve got particular colours in mind, we can discuss how we can give this stunning wintery design the personal touch that you deserve.